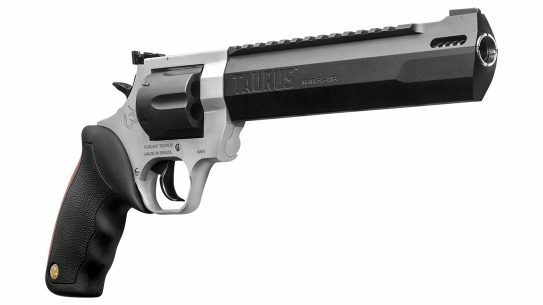 Steyr currently offers the STM-556 with 11.5-, 14.5-, 16-, 18- and 20-inch barrels. 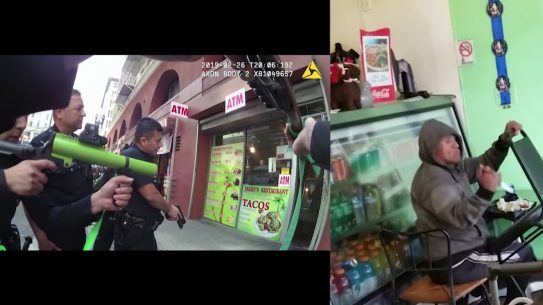 Note their AUG-style flash suppressors. 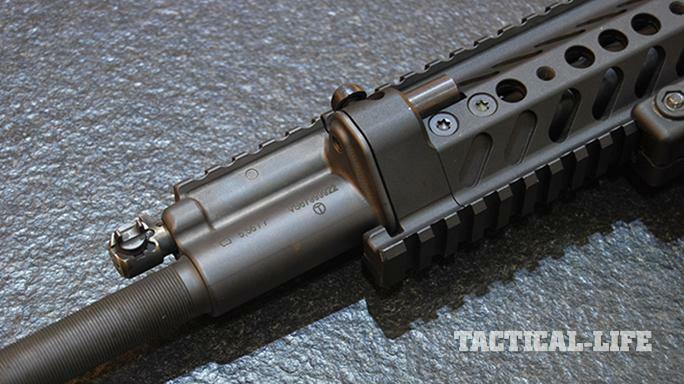 With the STM-556, shooters can quickly swap barrels and access the short-stroke piston in the field without any tools. The STM-556’s monolithic upper receiver features a long top rail for optics, including the railed scope Steyr originally built for the AUG. Despite all of its upgrades, the Steyr STM-556 can still use many aftermarket AR components, including Magpul furniture. 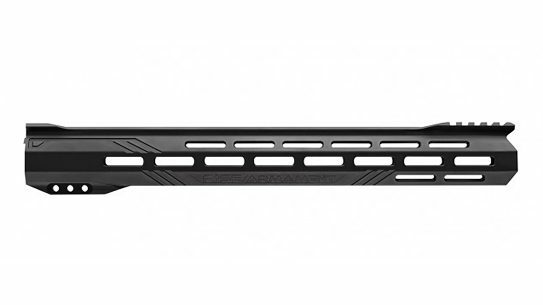 The quad-rail handguard makes it easy for operators to add mission-critical accessories like lights, lasers and vertical foregrips. 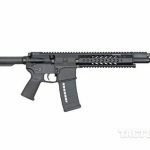 You may ask yourself with some boredom, “Another AR?” The question is a logical one considering that there are literally hundreds of similar ARs available on the market right now. 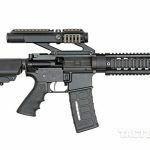 But look at the pictures again, carefully, because this is not an ordinary AR. 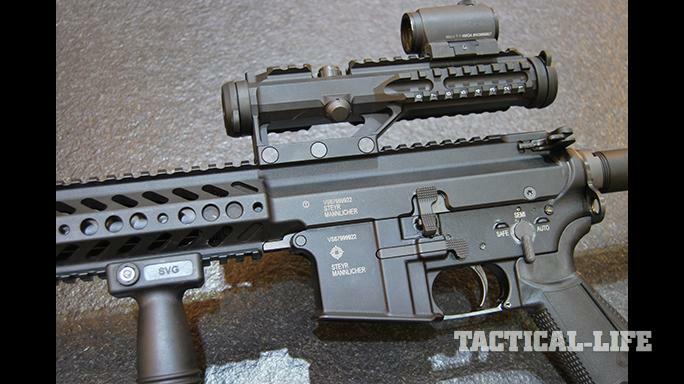 This rifle, made by Steyr Mannlicher, might actually be the best AR ever made. If you know the Steyr AUG, then you will already know about Steyr’s cold-hammer-forged barrels and ultra-reliable piston-driven gas system. 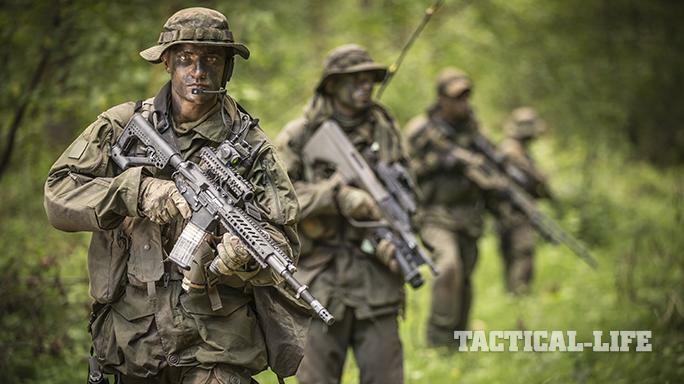 In dozens of military acquisition programs around the world, the AUG has proven itself to be one of the most reliable and accurate military assault rifles ever created. 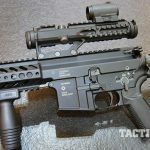 With this new STM-556, the Austrian factory has answered the call from some military users who wanted the same performance of the AUG but in a non-bullpup design. 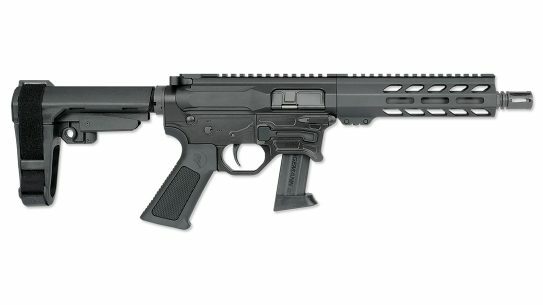 So, the company has combined two of the most successful designs into one new rifle that offers the best of both worlds. 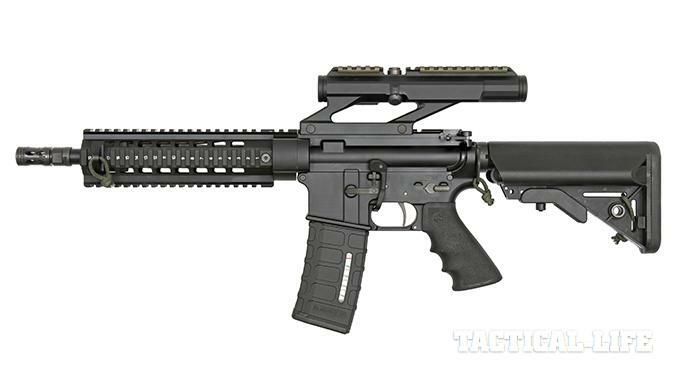 The STM-556 is sort of like an HK416 with some added features. 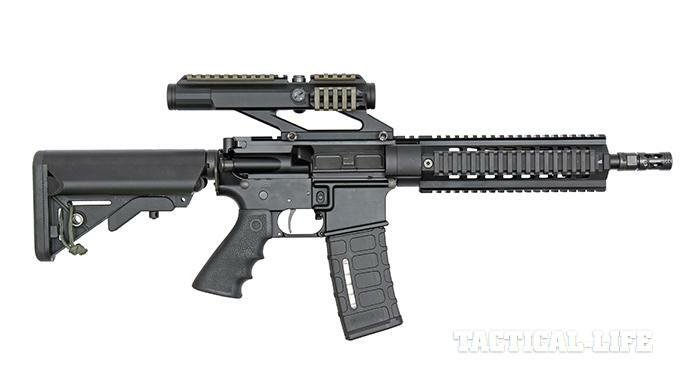 And while the STM-556 is currently still a military-only full-auto rifle, it will hopefully become available as a semi-auto rifle in the near future, too. 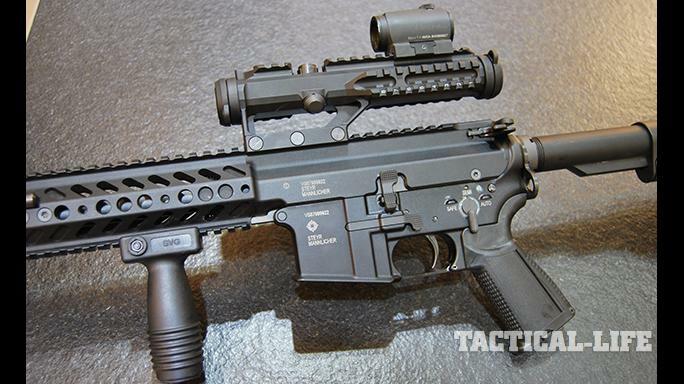 The most obvious feature of the STM-556 is the improved AUG short-stroke gas piston operating system. 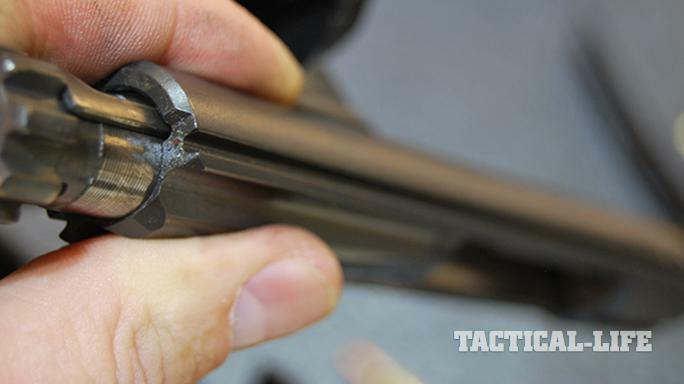 But its barrel can also be changed out in two seconds, according to Steyr, without any tools. 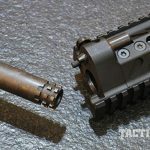 You’re also getting a guided steel bolt carrier group, a monolithic upper receiver with an integral handguard, an ambidextrous safety selector, the ability to load and unload the rifle with the safety engaged, a super-tough Mannox finish and a crisp, single- stage trigger. Let´s start our story from the beginning. The Armee Universal Gewehr (AUG) is an Austrian 5.56mm bullpup designed in the early 1970s by Steyr Mannlicher. It was selected and adopted by the Austrian army as the Sturm-gewehr 77 (StG 77) in, you guessed it, 1977. Since then, the bullpup has had tremendous commercial success and has been adopted by the armed forces of more than 35 countries globally. 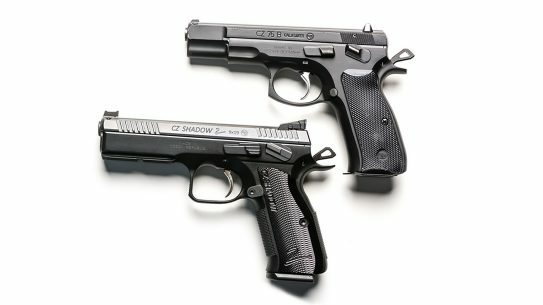 In 2012, Steyr received various requests from governments that had fielded AUGs and wanted the same performance from a less-conspicuous design. They wanted AUG performance on a rifle that looked like everybody else’s ARs. 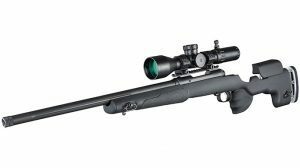 Steyr Mannlicher has been making rifles for over 150 years, and it’s known all around the world for building some of the best precision rifles money can buy. 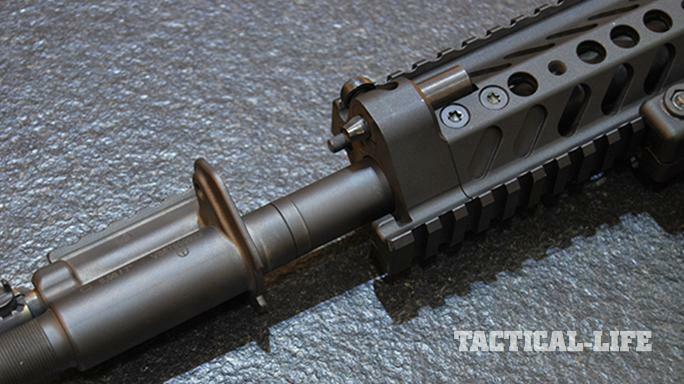 Adapting the AUG gas system and barrel to an AR-15 lower wasn’t much of a challenge for the company’s engineers. It became a secret project, and the rifles that were delivered performed admirably. 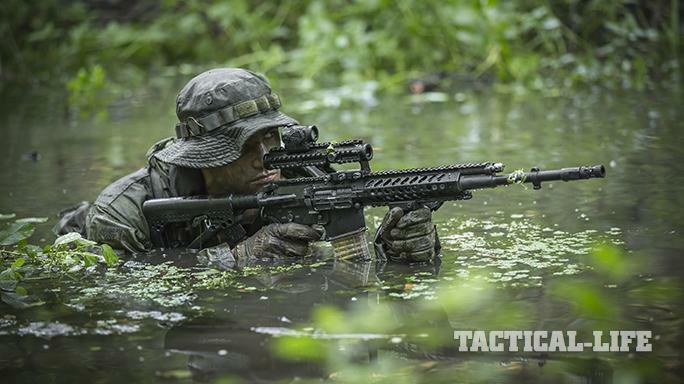 The resulting STM-556 was then added to the company’s military-only catalog, where it has remained as a hidden jewel. 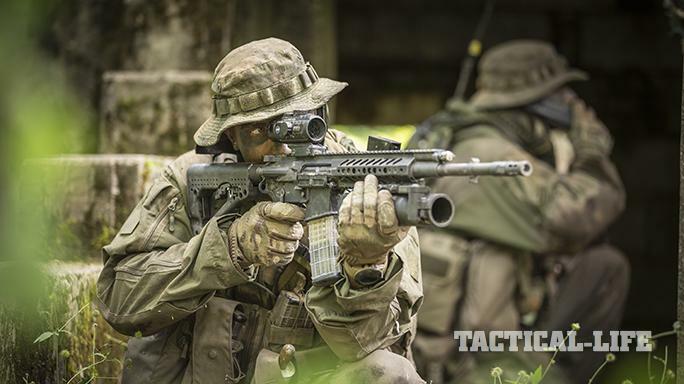 Then, when the German army put out a request for rifles to replace its aging HK G36 rifles, Steyr Mannlicher joined forces with Rheinmetall to manufacture and market the STM-556 as the RS-556 (Rheinmetall-Steyr) for the competition. 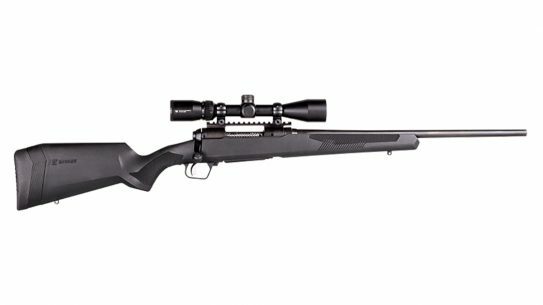 This German-Austrian collaboration resulted in the rifles being made in Germany, adding a key item to Rheinmetall’s growing array of infantry products, and it allowed Steyr to join another famous military conglomerate. This manufacturing location also makes it a perfect choice for the German army, which intends to replace the G36 by 2019. 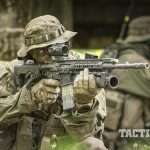 The RS-556 is based on the STM-556 but is slightly modified to further develop its outstanding modularity and to make it a future-proof 5.56mm NATO weapon. 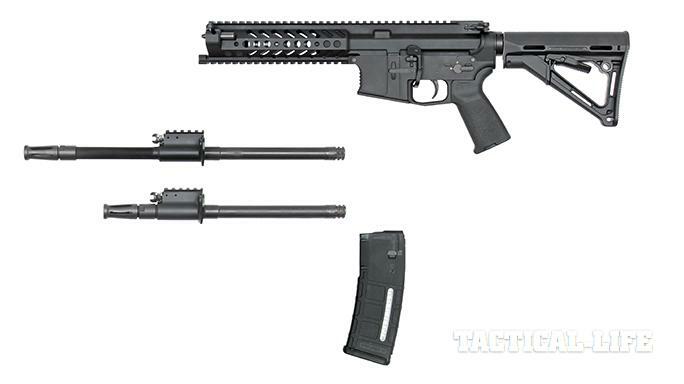 The STM-556/RS-556 features an adjustable short-stroke gas piston system and a rotating bolt based on that of the AUG. 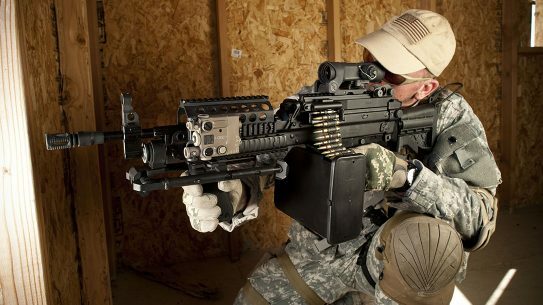 In full-auto, it has a rate of fire between 600 and 800 rounds per minute. The five-position gas valve of the AUG has been moved to the front so that less hot gases are expended while shooting with a sound suppressor. 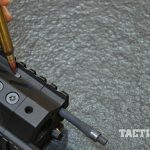 Another unique feature of the STM-556 gas piston is that it can be extracted without tools and in no time at all—a very convenient feature that will make for quick cleaning and maintenance. 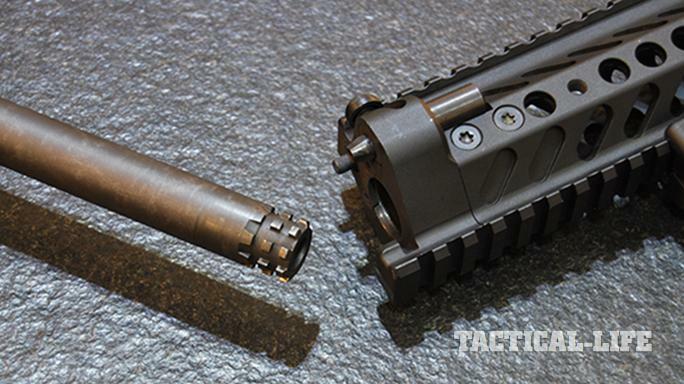 The barrel can be swapped out as quickly as an AUG’s, and the factory states that it can be performed in two seconds. 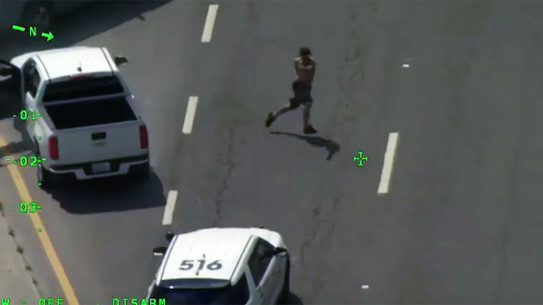 I have never been so quick, but something like five seconds is easily attainable. 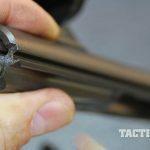 And talking about changing out the barrel, let me add that in my experience the rifle holds its zero surprisingly well after removing and reinstalling the barrel. 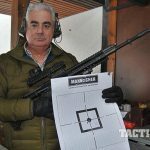 I consider 1 MOA to be a very stringent standard for an assault rifle, and the STM-556 I tested held this standard among barrels, which is very impressive. 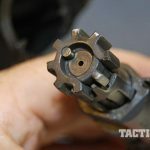 Several barrels are available, and they’re all chrome lined with six-groove rifling in a 1-in-7- or 1-in-9-inch twist rate depending upon the intended application. 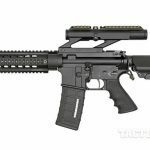 Even though there are various standard barrel lengths—11.5, 14.5, 16, 18 and 20 inches—any special length the military customer might want can be easily manufactured. 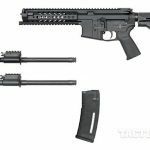 This is one of the beauties of the adjustable gas system; it will work no matter how the long or short the barrel is, unlike most direct-impingement AR-15s. 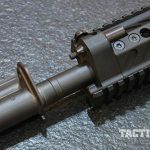 The monolithic upper receiver is CNC-machined from aircraft-grade aluminum bar stock, and it has steel inserts for enhanced durability and so the steel bolt can ride on steel for superior reliability. 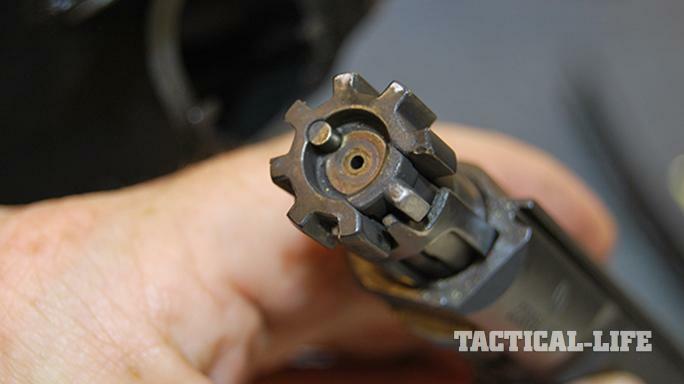 The bolt itself has a spring-loaded face with seven lugs as well as the AUG’s unique patented extractor with a semi-lug. 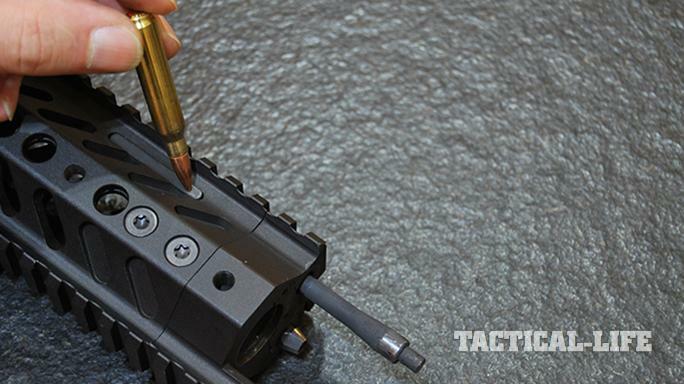 As you can see, this isn’t a typical AR-15 bolt, and it’s much more reliable. 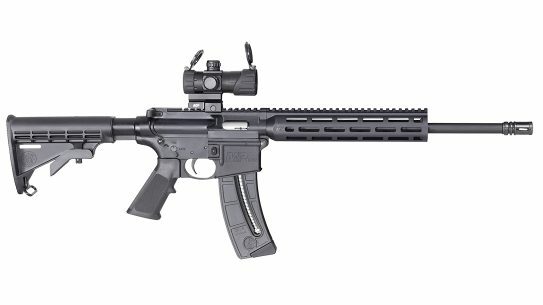 The STM-556/RS-556 features several standard and optional NATO accessory rails with receiver systems designed in accordance with MIL-STD-1913, STANAG 2324 and STANAG 4694. 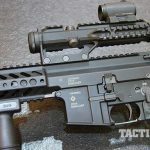 The top rail is a true STANAG 4694 design, which is more advanced, repeatable and stable than regular Picatinny rails, and it’s long enough to be fitted with Steyr’s superb AUG riflescope, an Aimpoint Micro with a 3X or even 6X magnifier, or any night-vision or thermal device. The side rails are ready for laser designators or rangefinders, and the forend’s profile makes it easy to route control cables as needed. A 40mm grenade launcher can also be mounted on the bottom of the handguard. 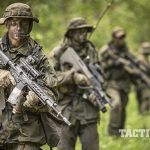 Moreover, the RS-556 is compatible with Rheinmetall’s modular “Future Soldier-Expanded System,” and can also be connected to other high-tech soldier systems. 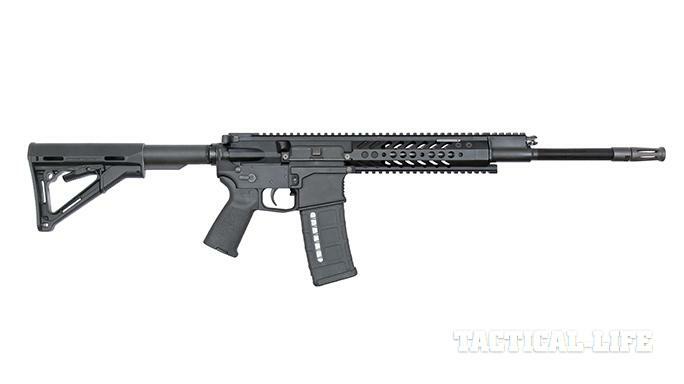 The lower receiver of this Austrian marvel is basically a high-quality, billet-crafted, fully ambidextrous AR-15 lower. 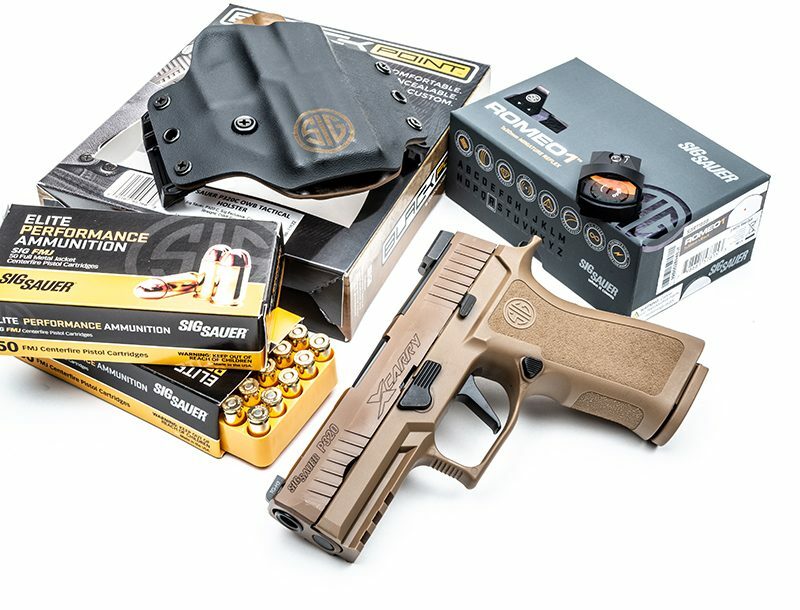 Heavily reinforced and redesigned in its weak points, it is compatible with STANAG magazines as well as standard AR accessories and triggers, which helps with maintenance and logistics. And talking about triggers, I found the trigger of the 2017 RS-556 version of the STM-556 way better than the one I tested back in 2012. 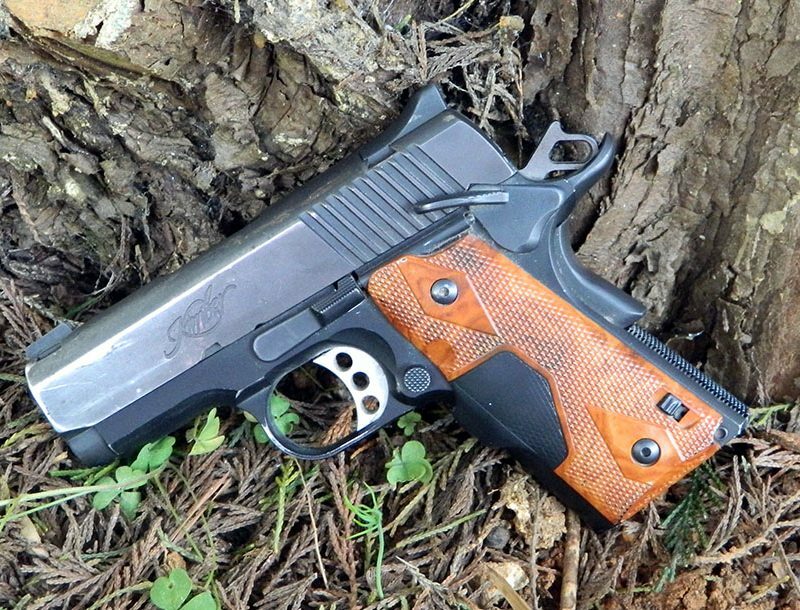 It is more refined with a crisp single-stage release at just 3.5 pounds. 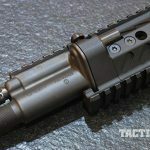 As mentioned before, the STM-556 trigger group has been modified so it can be placed on “safe” in any condition, which separates it from other AR-style rifles. 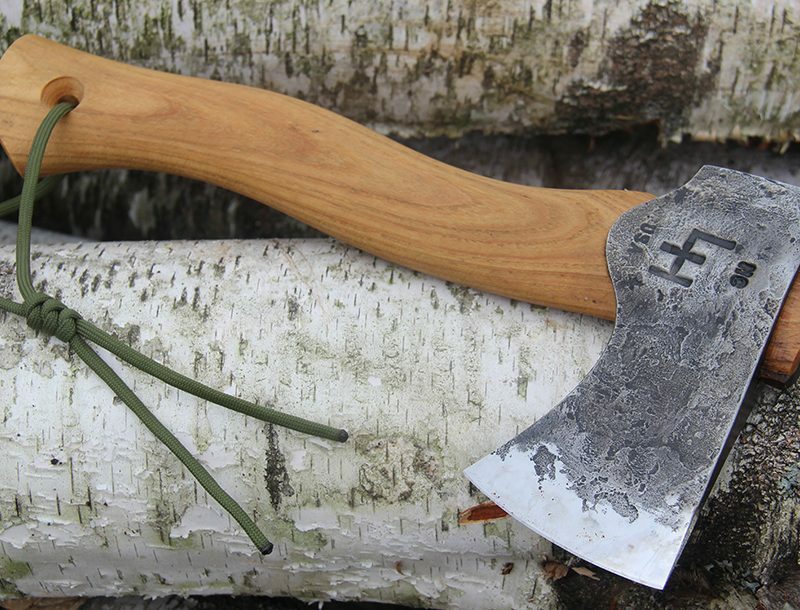 You might think that all these features come at a heavy price, especially with regard to weight. 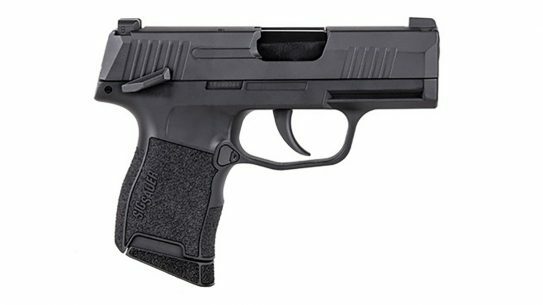 But with a 16-inch barrel installed and a fully loaded 30-round magazine, the Steyr weighs just over 9 pounds. Unloaded, it weighs 8.2 pounds. 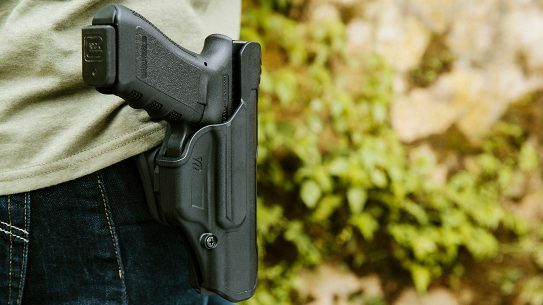 Finally, the collapsible, lightweight buttstock clicks into seven different length-of-pull positions, but the lower receiver can also use Magpul stocks or other aftermarket AR stocks. 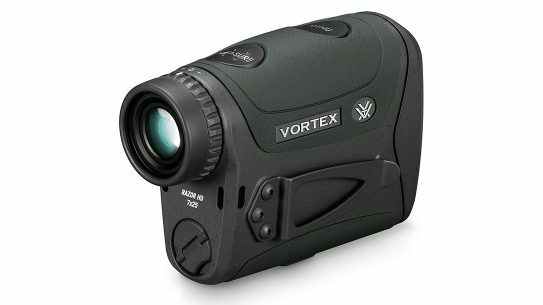 If you have read any of my previous articles, you will already know that I am a sniper and long-range shooter. I have been spoiled by high-quality sniper and competition rifles, and I only like accurate weapons. Therefore, I had to search hard to build my own AR collection, as most are just 3-MOA rifles. This isn’t bad for a military carbine, but I wanted more. Which brings me to Steyr. 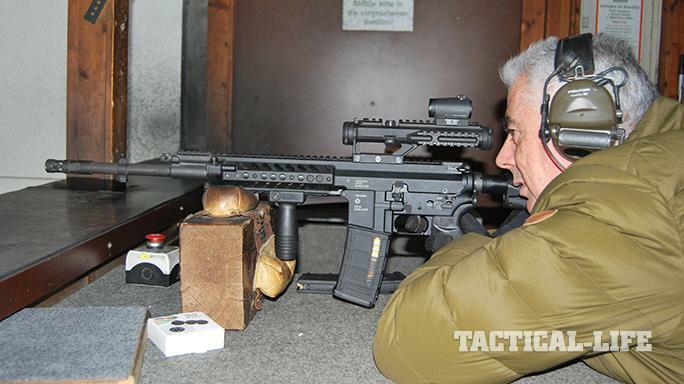 Every Steyr rifle that I’ve tested over the years has been accurate, and the STM-556 is no exception. I shot incredible groups with my old AUG, and this STM-556 performed just as well or even better. I need to spend more time with the gun and test more loads, but the results were impressive considering that I used regular hunting ammo and military-grade SS109 rounds. 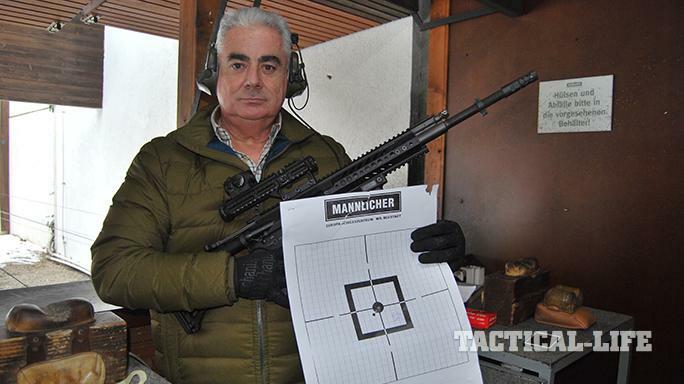 And when I say impressive I mean it, as even with these non-match-grade boxed loads, the STM-556 averaged 0.96-inch three-shot groups at the range, which is quite impressive for a military-grade select-fire weapon. 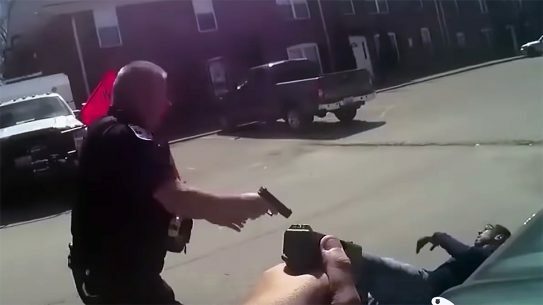 All of the shooting was done with the 16-inch, chrome-lined barrel. 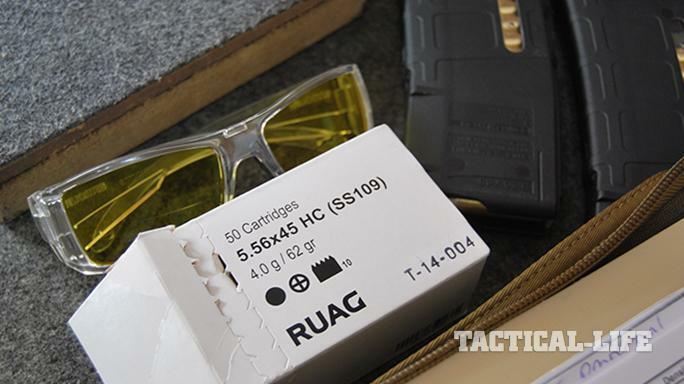 I was able to shoot about 150 rounds of RUAG’s 62-grain HC (SS109) ammo and only one box of Geco’s 55-grain Express FMJs. 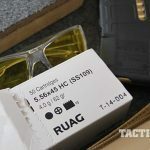 The STM-556 shot both the 55- and 62-grain bullets extremely well, and the average group sizes were 1.02 and 0.9 inches with the RUAG and Geco loads, respectively. Needless to say, I can’t wait to try this gun with match ammo. For some time now, my top AR has been a Sabre Defense rifle with a 16-inch barrel. 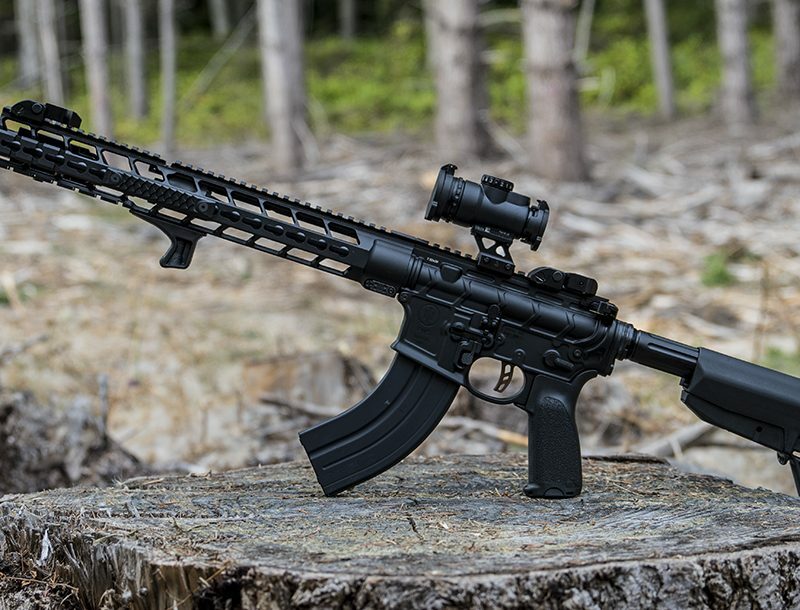 It is extremely accurate and reliable when it comes to AR-platform rifles. But now I know that I need to find a way to get an STM-556 into my collection, as it is just as accurate as the Sabre Defense gun while being more reliable, feature-laden and versatile with the quick-barrel-change capability than most other ARs. 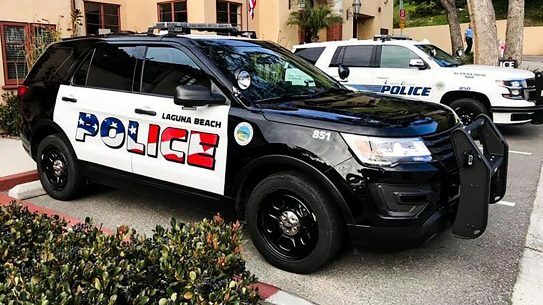 It’s just an impressive piece of equipment. 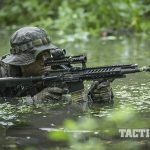 Even though the STM-556 is still a military-only rifle and Steyr doesn’t plan to make a semi-auto version or sell uppers anytime soon, I am sure it will eventually happen, and then I will be able to own what in my humble opinion is the best AR ever.